Located in South Austin, the community is situated amongst a forest of trees in a quiet little pocket between two of Austin’s main corridors. North Bluff has 66 homes ranging from under 1300 sf to just below 1700 sf, providing 7 home types for all life styles. 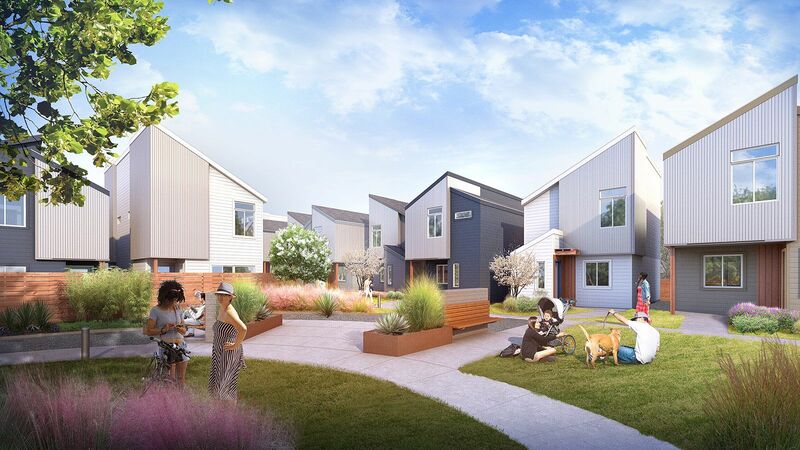 Large open living spaces, efficient storage, and lofted bedrooms allow these compact, sustainable homes to “live large”. Constructed of modern materials and bold geometries, the homes provide a simple yet modern aesthetic throughout community. While the community is located near many urban amenities, North Bluff also features its own outdoor amenity areas with trails that run throughout the community surrounded by native landscaping, and the natural vegetation of the area.